First take the four bigger ones of the egg shaped punched pieces and move them one above the other into the two medial slits. Then, proceeding outward, add the medium and little pieces. 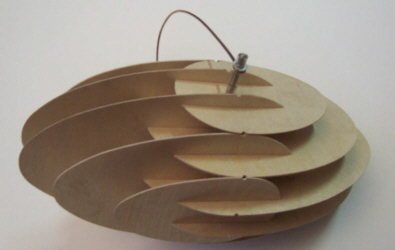 Thus, the ellipsoid is made. The dents designating the narrowest part of the ellipsoid must lie in-plane now. Then, you may push the axle through one of the two strings of aligned holes. Insert the ends of the axle in one ear at the end of the fork each. Secure the axle by fixing a shim and a tube to both ends. To suspend the object, fix a thread to the middle of the fork. If you want to suspend the WindEllipse outdoors, please give it a good varnish after assembling. You may use colored etching or pickling before you assemble the pieces.